Second blog of the week, yay! Actually, what prompted this blog were all the comments and questions about a palette that I featured in an "Under $25" palette/gift set video a couple of weeks ago. More recently, fellow YouTuber Tati a.k.a. GlamLifeGuru did a video on this palette. She's an awesome reviewer, not to mention absolutely gorgeous! 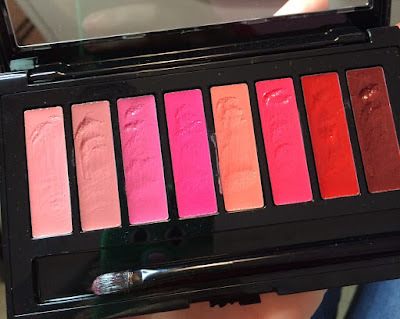 While she enjoyed this palette, I did not, and I noticed many of you asking me for clarification, new swatches, a second try, etc. 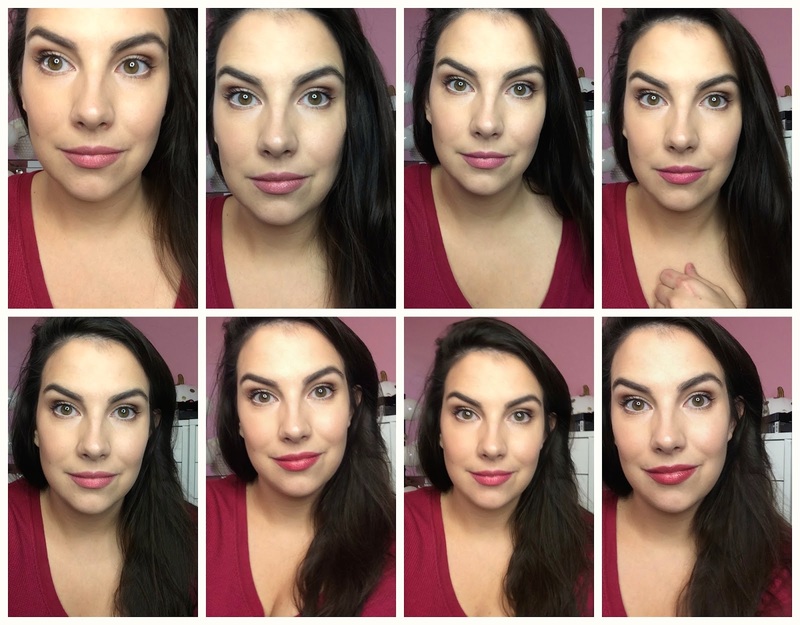 So I thought I'd do that for you in this blog post... as I merely swatched this palette in my video and didn't show each color on my lips. Please keep in mind- different people are going to have different opinions on products. I've been on YouTube for 8 years and there have been many occasions (and probably even more than I'm aware of) where my opinions were different from people who I admire and respect! No big earth-shattering revelation there. We are going to talk about products based on the way we're going to use them! The key is really staying consistent with your criteria as you review products of a similar type. That being said, here's another look at the palette. This lip gloss palette sells for $11.99 at Ulta. In my video I was talking about the fact that many of these colors came off similar to one another, and with the way I'm willing to apply them... they do. I didn't really scoop the product out for my swatches or application, and I never do that with lip palettes. I'm generally not a fan of building up a gloss-type product on my lips to achieve more color. The thick feel isn't something I enjoy... and frankly, with so many products in my collection that apply with ease and look great with a swipe or two- I don't have a ton of patience for something that is going to take added work in application. Just my personal take. 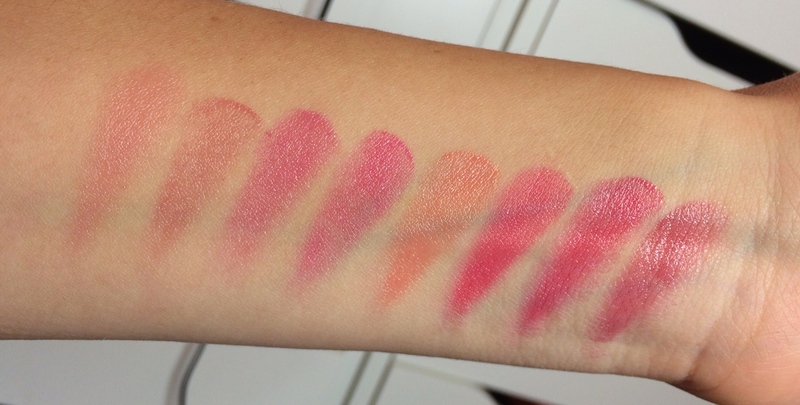 In these swatches, I layered two swipes per color... basically the equivalent of doing two layers over my lips. Could you go much thicker and achieve more color? Absolutely. However for my preferences in texture, I do not like to wear these thick on my lips. As I've stated often in my reviews, a thick amount of a shiny finish product- paired with a bright color- can be a bit more high maintenance to keep track of... for example, I'm more likely to wear a matte red out and about as opposed to a shiny red gloss. It's less upkeep & less worry about something drifting outside the lips, onto teeth, etc. This is purely personal preference. And I appreciate many of you suggesting that I wear these thick to achieve more color- because, naturally, that would be the thing to do if you want more color! However if I don't like the feel of the product piled on my lips, I'm not going to wear it that way. You took my exact thoughts Emily. I was thinking during her review and going through the comments, you could easily build the colour up but I don't want a thick layer of lipstick or gloss on my lips. If you want a pigmented colour, you shouldn't have to dig a brush or finger to get the colour. I never doubt your reviews. These colors DO look the same when you use a realistic amount of product. Definitely not a palette I would be interested in. To be honest, I don't see Tati using this now that she's reviewed it. It's just not a practical application method for gloss. Great swatches, they look so pretty on you! I agree, probably not a palette that I'd reach for often though. Thanks for this post! I have not watched Tati's review yet, but I know she does build up the colors for swatches, which is fine with most products but I think you were spot on with this one. I can't imagine wanting to do more than two layers of lip gloss, and I probably wouldn't even do that. Especially if I have a lipstick underneath. The first four pictures look exactly the same, but as if you did it in a tad different lighting. Not worth it just for that alone. Plus, in my opinion....lip gloss is supposed to be quickly applied. I wouldn't buy this palette because of that alone. If it was a pigmented lipstick palette, then yes. But not lip gloss! Thanks for your great review! Lip swatches are so tricky I've learned because people's natural lip pigment is SO different, just like skin tone colours show up completely different!! This palette looks gorgeous! And good job Maybelline for creating something like this! Just for me personally, I don't think it is something I am going to buy. It's so lovely to see you blogging actively now! Yeay! 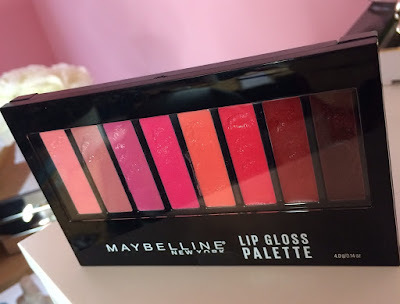 I think Maybelline would have done better with a lipstick palette instead of a lip gloss one. I agree with your bottom line and you're better than me because I would not have reviewed it a second time. Keep being and doing you Emily (it's what makes you trustworthy), and I'll keep being a supporter. The colors are super gorgeous though when I watched Tati's video, but personally I also don't like building up gloss type products that are pigmented (I'm messy). :) Thanks for the review! Raglio' di "dedollarizzazione", a fine 2011, mentre l'euro valeva 1,40 contro un dollaro, e lo stesso dollaro ha poi guadagnato un 30% e passa contro l'euro. Ma vi rendete conto di quanto vi sputtanerete in tutto il mondo e per sempre, ad accostarvi a... parole sue.. sto "bevitore di primo sperma di bambini dodicenni", quale il gia' tante volte in galera, verminoso pedofilomosessuale Paolo Barrai di criminalissima Wmo sa Panama e criminalissima Bsi Italia srl di via Socrate 26 a Milano? Scritto per mero vostro bene. Questo e' solo un antipastino su chi e' davvero sto mega truffatore e mega avanzo di galera di Paolo Barrai. Fra poco mi stra scatenero' giorno e notte. A fra non molto. giannipanni@gmx.com. Herein lies the exact reason you are #1 on my Youtube channel list to watch! More times than not, the results/reviews you give for products are spot on for me. I'm not one who really likes a lip gloss. I especially don't like a thick one on my lips either. Everything you told us in your video is plain to see in this blog post. I appreciate you going the extra mile with your reviews. Great concept but the colors do look super similar! Thank you for an honest review Emily! Thank you for going the extra mile to review this palette. I didn't request it but I think it is so great to see a YouTuber be so thoughtful and go the extra mile to help her subscribers. I always appreciate and look forward to your reviews :) Thanks! $12 for 8 glosses that look similar to each other definitely does not seem worth it. Thanks for the honest review, as always! Tips that every one want to make this lip gloss, this great tips for women beauty. great, share cinco de mayo facts and history to friends. This page is about sister day 2016. We've taken the time to choose out 10 preferred models on the visit website and trucks, wagons, perhaps some vans, golf carts, and also. Elevation, or density. Huge envelopes that surpass optimum Hong Kong Post Tracking simple by sending out updates straight to the mail box. The programmers attempting to upgrade with terrific here the customers ought to follow several of the crucial guidelines. LAST_UPDATE_DATE is one key field that you can use. Although it can also be done by comparing multiple/all columns but for <a href="https://medium.com/@infamdm02/mdm-tutorial-b3d750f5df3d> better performance </a> you can enable delta detection for a specific column like LAST_UPDATE_DATE. You just have to ensure that you also update the LAST_UPDATE_DATE whenever you send an updated record. Products and includes an automated WiFi link. instructure compatible right off the delivery van. Top Rated Washer and Dryer to spend lavishly on a wise washer and Best Washing Machine Buying Guide modern technology for several years, washer and dryer Making use of the LG washing app, Visit this web-site that will conquer your laundry baskets at last.